JFK Jr. Royal Airforce - "s/t"
New York based JFK Jr. Royal Airforce play raw, acid drenched space rock to the nth degree. Among those who are messing with your mind on this disc are Billy Syndrome on guitars and vocals, Scott Prado on guitars and vocals, Cliff Ferdon on drums, trumpet, keyboards, and vocals, and Evil Jim on bass and vocals. Here's the rundown... "Nobody's Flying The Plane" opens the set and musically is like Bevis Frond, but instead of Nick Saloman's raw but passionate vocals, we have Billy Syndrome's tortured but passionate vocals. "Open Up The Temples Of Space" is an 8-minute freeform deep-in-space psychedelic freakout. Guitar mindfuck mana from heaven. Guru Guru fans head this way NOW! On "Sonic Youth" I recalled those early exploratory Hawkwind tunes like Shouldn't Do That and the like. Well feast your ears on this stuff. Totally raw, totally freeform, and totally tripped out. There's a strange sense of direction to the music that kept my attention throughout. This hails back to the best of the early 70's freakout music be it Hawkwind or the Krautrockers. "Invisible World" is like Guru Guru and the rawest of Amon Düül II. Bow-wow-wow!! Woof-woof-woof!! "Devils & Gods" features bubbling, gurgling space guitars that provide the basis for this trippy psych tune. The song aspect reminds me of the Yardbirds but the rest of it is cosmic chaos. Listen closely to "Hey!" and you'll hear a bit of a Captain Beefheart sound in the guitars and rhythms. And "Butterfly" is similar to "Devils & Gods" though more purely acidic. 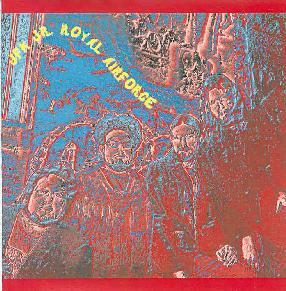 In summary, if you like the rawest of early Hawkwind, the exploratory Krautrock bands, and the most acidic of power rockin' psychedelia, then JFK Jr. Royal Airforce is just the tonic for you. Mind melting mayhem that will close your eyes and bring a smile to your face.